A well-constructed advert starts with a quality concept. Whether it’s a clever publicity stunt, a simple print advert or a dynamic television commercial, good advertising gets noticed, and what gets noticed gets talked about. While your business may lack the resources of a large corporate brand, it’s great to see the things that some brands are capable of producing. We’ve brought together some of our favourite ad campaigns from 2016 – from video, to print and publicity stunts, these excellent offerings demonstrate the power of advertising and how the best set themselves apart from the rest. Apple hardly needs to advertise to sell its products; one of the most successful consumer technology companies in the world, the company’s products sell themselves. From university campuses to coffee shops, the Apple logo is universal and their branding is considered by some to be iconic. This advert really isn’t about a simple feature of an iPhone – who needs reminding that a compact touchscreen computer can do something as simple as run a timer? Instead, this advert is about Apple having fun and bringing their product into the spotlight. Bookmakers are heavily regulated when it comes to advertising, having to work within a strict set of legal and advisory parameters. As such, bookmakers (and their marketing departments) have to work extra hard to make sure that the adverts they put out comply with all the rules while also trying to stay appealing and relevant. Paddy Power has been inventive, crossing the line of controversial on more than one occasion with their various publicity stunts. It might not be to everyone’s’ taste; the company has frequently courted controversy, but the publicity stunt has been a reliable medium for the bookmakers, allowing them to circumvent some of the more restrictive regulations while also helping to build a strong brand identity. In 2016, Paddy Power made the headlines when they sent a Mexican mariachi band, Juan Direction, to Scotland to greet Donald Trump in response to the US President’s comments in the run-up to election. You can see some of the other stunts the Irish company have got up to here and here. As publicity stunts and adverts go, this Carlsberg combo hits home; showing the generosity and thoughtfulness of London’s commuters willing to offer their seats up to an older passenger – who was, in fact, football pundit Chris Kamara in disguise. As sponsors of the European Championships, Carlsberg decided to reward kindness with football tickets, dressing Kammy up as a thoroughly convincing pension-aged passenger and filming his travels through the capital. Anyone who offered up their seat for the former Swindon Town midfielder bagged themselves tickets to England’s European Championship fixture against Russia. This was a heart-warming, funny advert that showed that football has still got a place in the nation’s heart. The Olympic games are the highlight of the calendar year in which they’re held, with everyone making the most of the hype. However, this Gillette advert really shows the dedication and professionalism it takes for athletes to reach the top of their sport. While the Paralympics can go somewhat under the radar, Channel 4 made sure that this touching advert reminded people that while the main event was over, the games were still on. As the rights holder for the event, Channel 4 pulled on the heartstrings of viewers with this powerful advert, which was as much about the strength of human spirit in overcoming adversity as it was about sport. With more than 140 disabled participants, the advert did more than just promote the broadcasting of the Paralympic games – it tried to tackle negative perceptions of disability. Getting your audience emotionally invested is a great way getting their attention, and the producers behind this advert ticked all the right boxes. Christmas is the time of year when adverts really come into their own, the crowning achievement at the end of a glittering year. With every retailer out vying for the crowd of Christmas shoppers, it’s important that adverts really grab an audiences’ attention. John Lewis has been the undisputed master of the Christmas advert for the last few years, thanks to their plot-driven adverts. Coupled with dramatic music, heartfelt storylines and likeable characters, the airing of John Lewis adverts have become something of a cultural highlight in the calendar, signalling the countdown to Christmas. The Coca Cola advert, for example, is a watershed moment that many people consider as the beginning of the festive period. But this time around, there was some stiff competition to be crowned the champion of festive advertising; from Amazon and Aldi right through the alphabet of retailers to Waitrose, via H&M, Heathrow and House of Fraser, there was an abundance of adverts to allure shoppers. It was difficult to judge, but we think H&M won the title for Christmas Advert 2016. Getting Wes Anderson on board to produce the advert proved to be a masterstroke, and the director brought his unique visual style to the production. 2016 was a year of sport – and ITV nailed home the importance of supporting our athletes. The team behind this advert couldn’t begin to dream of what a successful sporting year it would be, though. Andy Murray won his second Olympic Gold medal, his second Wimbledon title, and became the world No.1 at the end of a busy year. Golfer Danny Willet became only the second Englishman to win the Masters, while in the Rio Olympic and Paralympic Games, Team GB brought home 67 and 147(!) medals, respectively. Oh, and the brand’s behind football’s European Championship stayed quiet when England lost to Iceland in what has been called one of the most embarrassing defeats in the country’s footballing history. You can’t have it all. In London, Glimpse creative agency kick-started a Citizen Advertising Takeover Service (CATS) campaign, replacing 68 advert slots across Clapham Common Underground station with pictures of cats. These feline hijinks were part of a campaign to get people thinking about the prominence of advertising in our daily lives. Apple make this list, too; their Apple Music streaming service has been hugely popular – and this advert might be why. Superstar Taylor Swift gets carried away singing along to a hit rap song (Drake & Future’s ‘Jumpman’). Also in London, this false-flag operation turned advertising upside down. 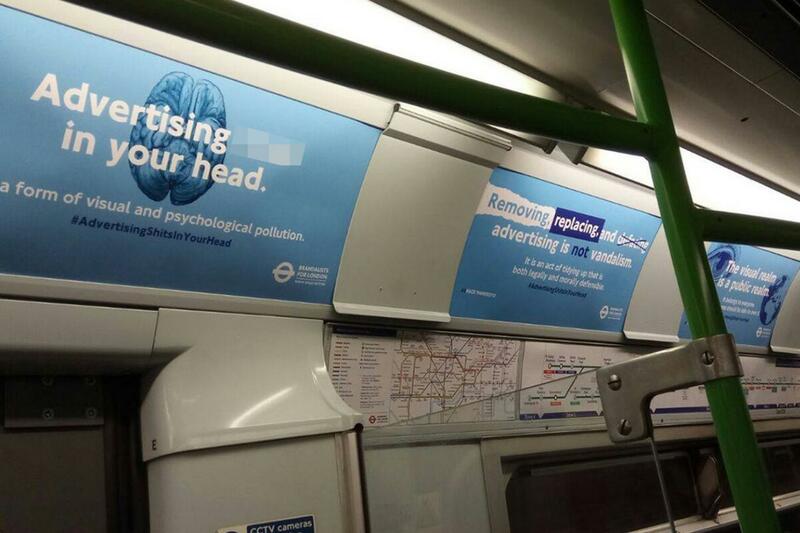 Dubbed ‘brandalism’, the covert manoeuvre replaced 400 adverts throughout the London Underground with… adverts… encouraging debate around the nature of advertising in public spaces, and the potential negative effects of excessive advertising.